On February 28, 2013, Sadequr Rahman Sayedee was martyred by gunfire of police, BGB and Awami Chhatra League, when he was among protesters who were protesting against the court verdict of Allama Delwar Hossain Sayedee. 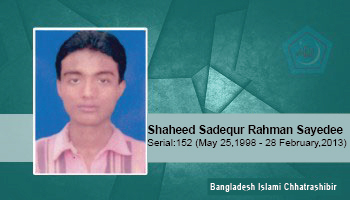 Sadequr Rahman Sayedee was a Shibir worker, and a HSC examinee. Siblings: 2 sisters 1 brother, He is the 2nd. Place of martyrdom: The bullet tore through his forehead and went out from behind, leaving him martyred on the spot. The bullet tore through his forehead and went out from behind, leaving him martyred on the spot.